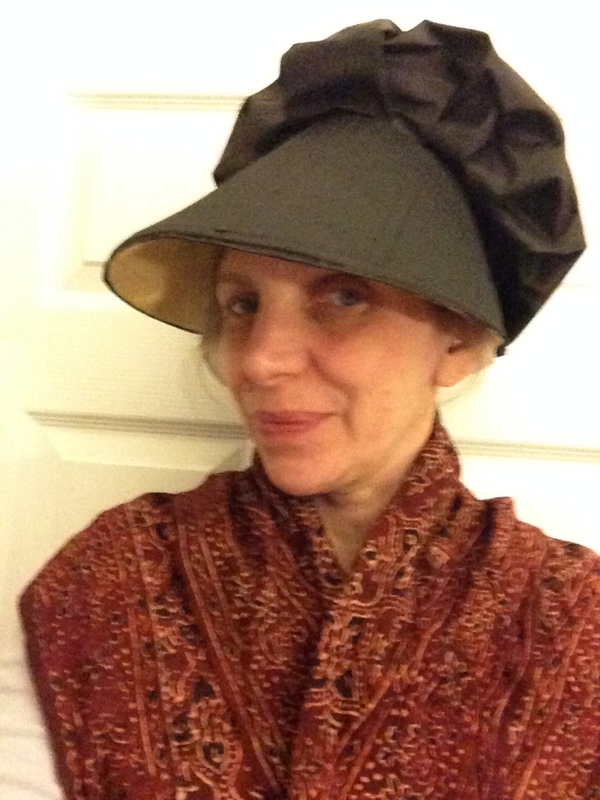 I used the Kannik’s Korner bonnet pattern (view F, I think) as the basis for this because I already had a brim, lining, and caul cut and in a drawer. Given my current medicated state, using something pre-cut seemed advisable. That means I didn’t play with the brim to create the line of the Williamsburg bonnet, or the curve of the brim in the “Fortune Teller” engraving. Is this style acceptable for the period I typically interpret (1775-1783)? Well… there are other examples of the lampshade-style bonnet, as in the Edward Penny painting of the Marquis of Granby. This painting is dated “after 1765” so there’s some room for interpretation there…too much room. But if that’s 1765-1770, and the “Fortune Teller” is 1789, I think we have comfortably covered the 1775-1783 time frame, even if it is a bit like a queen-sized blanket on a twin bed. Front view: more lamp-shade like. 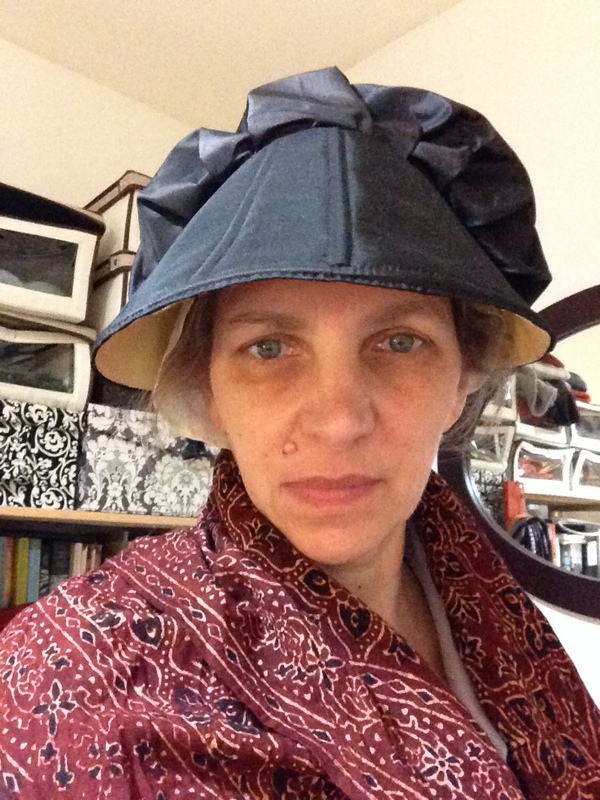 As you can see, the bonnet does have some lamp-shade-like tendencies on my head, which I consider a benefit. I like the way the ribs are visible, even if I remain unconvinced by the caning. I think it’s a little too wide, and lacks resiliency, though to be honest, I have only felt baleen at the New Bedford Whaling Museum, where there is a large sample on the second floor. The channels are all hand-sewn, and then the cane was slipped in. 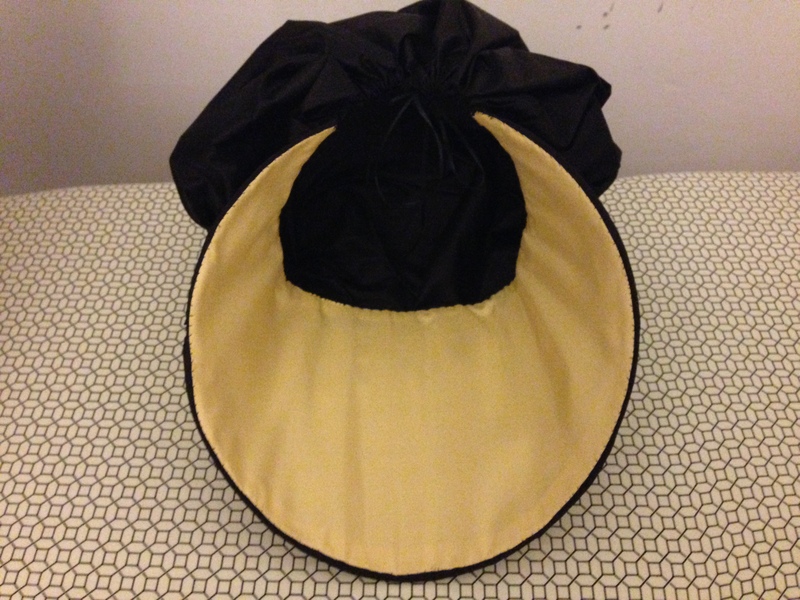 I stitched the black taffeta caul to the first three layers, and then lapped the yellow taffeta over the raw edges and stitched it down to finish the brim/caul seam. No, I didn’t take any in-process pictures…probably because this took considerable snake-eyed concentration last weekend. Usually, I line the cauls of my bonnets, but through shear laziness or distraction, I opted not to this time, and I think I’ll leave it this way for a while. You will also note that I have not trimmed this: I have some black silk ribbon coming, and I may try that. I don’t have enough black taffeta left to cut self-fabric ties, and there do seem to be some plain examples. 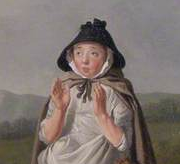 A plainer, lamp-shade-like bonnet may be just the ticket for Bridget. What would I do differently? Next time I would definitely play with the brim shape using a paper template. I’d like a lower, curvier, brim. Once I had the shape worked out in paper, I would use that as a template to cut the taffeta and horsehair or light buckram layers. I’d also try zip ties. I know: not period correct! But short of risking federal prosecution resulting from a trip to New Bedford with some shears, I’m not sure that anything other than plastic will have the resiliency and spring that baleen has, and that made these bonnets so special. I thought of them while making this bonnet, but I think Mr S used them all at work in the past two months. 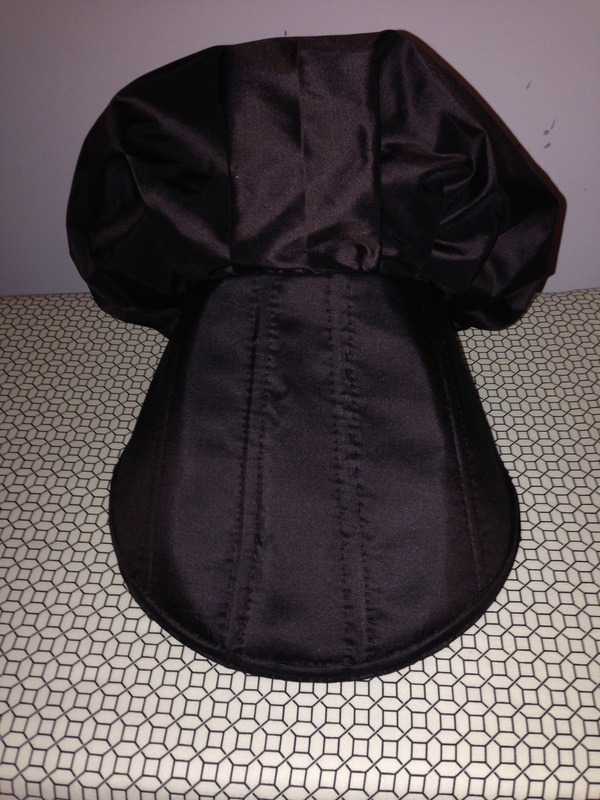 A Facebook friend has been thinking of zip ties, though, and has a hankering for one of these bonnets. I can’t say that I blame her– and honestly, I think I might join her. It has to be a flat rib right? I’m finding round canes have more “boing” than flat. But, the years I am playing with have round canes. I wonder if a half round cane would have the “boing” and still look flat if turned flat side up. Though, that might just cause it to curve in the wrong direction. I think you want a hint of a curve down. Right? Your flat canes are either stick straight or with a hint of a curve up. At least, that is what I’m seeing. If the curve of the ribs is the case, another option might be to slightly shape the reed first. I’d go for pinning it to an outline on foam or over a ham. I used partially- round canes; the one in the front brim curve was thinner, and I pressed it to make it lie flat, so I basically squashed the life out of it. I’m not sure what two years in the basement may have done to the canes, either. It may be that slightly fresher (soaked?) canes, or canes with a different profile, would work better. I know that one wants round canes for a Calash, and it might be worth trying them in a ‘plain’ bonnet. I just wish it was easier to get my hands on caning– in that you can’t feel before you buy online.